This is officially my first outfit post of 2014! Since the weather here is currently below freezing, I decided to show you my favorite coat of the season. I recently scored this MICHAEL Michael Kors coat from Nordstrom Rack for only $99, compared to its original price at almost $300. Before purchasing this one, I had always gone for cheaper, low quality coats. The more the merrier... right? Not exactly. I've learned that when buying coats, it's wiser to make an investment in a few great quality pieces. Besides buying for fashion, it's imperative to choose a coat that will last through harsher conditions for a longer amount of time. When I saw this piece in Nordstrom Rack, I just couldn't put it down. It fits perfectly and keeps me very warm at the peak of winter. If you need some extra convincing, I'm actually only wearing a t-shirt underneath in these photos. 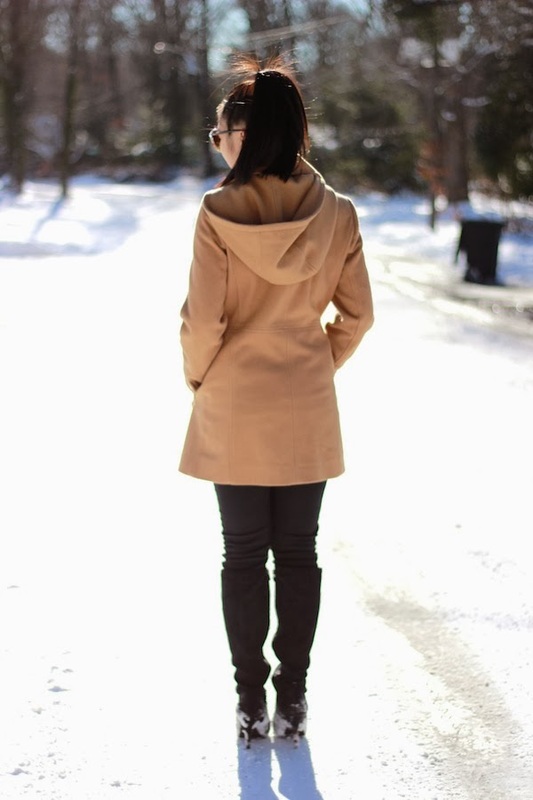 Click the first two photos below for links to this exact coat! I couldn't find it for the same price, but feel free to give it a try! If not, I still suggest investing in a quality coat for the winter. If you can't spend the money, Macy's always has great sales, and H&M has been stepping up their quality game. Nordstrom Rack is always a fantastic place to look if you live near one. I always find amazing deals there considering the brands they sell. Nordstrom just never disappoints! I hope you are enjoying your first week of 2014! Leave a comment below telling me about your favorite part of your winter wardrobe. Talk to you soon! I am absolutely in love with your coat, you look gorgeous! Babe! I adore your blog soo much!! Amazing coat! I'm your newest follower on Bloglovin' :-).. Hope you can follow back! Gorgeous look ! I really love your coat, suits you perfectly! Such a chic snow bunny!! Love the ponytail. Really adds the right touch!